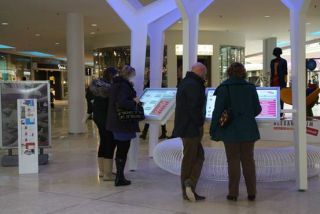 PresTop in Holland has used the visualplanet touchfoil™ to bring the Alexandrium Shopping Centre in Rotterdam up to date by installing six different touch displays. The displays are a main feature of the shopping center, welcoming shoppers and visitors at the entrance, and guiding them around the 1.6 million sq. m retail facility. The installation features six displays: 2 touch kiosks, 3 42” hanging displays and a custom-made 2-sided 42” touch totem located in the heart of the “Living Mall”, all made interactive by the touchfoil™. Shoppers are able to interact with the displays to find the outlets they wish to visit through an innovative way-finding software application that allows shoppers to search for stores based on their category and access detailed information and animated route maps and descriptions. “With the visualplanet touchfoil™ we can make solutions that look good yet are still vandal- proof, useable for public spaces and easy to keep clean without being affected too much by outside influences”, Richard Roggeveen, Account manager PresTop Products.